Joe Tomkinson is the oldest resident to be born in the village – he was born and lived in Lane End Cottages – these were located in fields behind Mount Pleasant/Willowbrook but no longer exist. He used to walk to Seighford School, and checked the time by the clock on Seighford Church Tower to make sure he wasn’t late for school. The school bus started just after the war in 1945. Beryl and her sisters used to walk to Lotus and English Electric Factories where they worked. Farming has changed a lot since Joe was a boy. Derrington was made up of small dairy farms (Myers collected the milk in churns and took them to Market Drayton for pasteurisation, however Fosters at Aston by Doxey used to process their own milk) though some did diversify into small crop farming. Lane End Farm grew sprouts and peas for selling, they employed about 8 people to do this work. A Mr. Ward and then Mr. Swinscoe were tenants. David and John’s father (James Leighton Rawsthorne) bought it from a Mr. Goring (who didn’t farm it himself) in 1946. 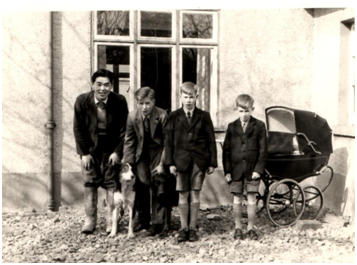 Mr. Rawsthorne also hatched chickens, which came from a free range accredited flock, and employed Japanese ‘chicken sexers’ who were very efficient at sexing the chicks, female chicks were kept but the males were destroyed. He later raised pigs; whey from milk bought from Myers, and which was mixed with ground corn, was given as feed to them (they used to mix the feed in a concrete mixer). The Leighton’s (David and John’s Grandmother’s side of the family), have farmed in the area for generations. Men came to thresh the corn which they grew for the chickens and cattle. They brought dogs in to get the rats – there were barrow loads as the sheaves were heaving with rats. 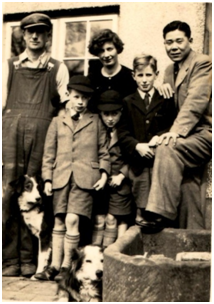 The family moved from Lane End farm as the village began to develop; it proved difficult to move the cattle along the roads as they were jumping onto/over low walls onto gardens. James Rawsthorne sold the land, which only had planning permission granted for properties facing Mount Pleasant – planning permission was later obtained by the owners of those properties to develop land in Willow Brook, part of which was the old sewer bed. Blue Cross Farm was owned by a family called Meesons and they farmed land where Castle View Flats now stand. They also were a dairy and poultry farm. A Miss Wolfe, (who apparently was a champion swimmer! ), married a Meeson. A Mr. Wilkinson took over from Meesons, and they farmed mink. The Hodkinson family owned the Old Hall and the father committed suicide on the railway line – he left two sons. The Turners took over the farm and Yew Tree Close was named after an old Yew Tree which was originally opposite the entrance. The change in farming methods has impacted on the environment. The field sizes used to be much smaller; there was a financial incentive to make the fields larger and due to this we have lost many hedgerows. Butts were made (undulations in the land) for drainage purposes, these are no longer there (due to cultivation) – there were also brick and ‘horseshoe’ drains under the soil. In 1967 the farm was self sufficient – the Ministry of Agriculture pushed and encouraged farms to be self sufficient. However, when we entered the Common Market, farms were allocated with quotas which only allowed them to produce a specific amount – the country had to then buy any shortfall from other member countries. The area now has only one intensive fruit farm (belonging to Busby’s) and one mixed farm (belonging to John Rawsthorn) – all the small dairy farms have gone and houses have been built on the land. John uses very little fertilizer due to rising costs; he uses the traditional way of farming via a 9 year crop rotation, producing cereals and potatoes. He has cattle and is an intensive sheep breeder. Stallbrook Hall is the oldest house in the village. When the children heard the trains coming, they used to stand on the railway bridge and let the steam/smoke go over them. The train driver used to drop lumps of coal off in exchange for eggs. Every Friday night during the war, there was a dance at the Village Hall for Airman from Seighford airfield. The first Wedding Reception held at the Village Hall was Joe’s sister Beaverly Tomkinson, who married Fred Moore. At the end of the terrace of cottages in Mount Pleasant, there used to be a sweet shop owned by the Hodson sisters. Mr. Dix used to keep the Red Lion – there was a cottage attached to it and Mr. And Mrs.Foden lived there. Reg Taylor kept the Three Horseshoes. There was a shop and post office next to the pub, owned by Mr. Horatio ‘Race’ Clay (who also kept bees), which then passed to Roy Clay and his wife Ivy.